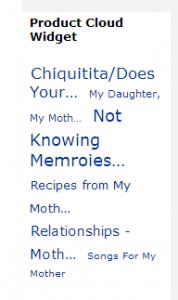 Seriously, of all the posts on my blog since 2007, the one post I wrote about my mother is the one that it chooses to highlight. Insensitive bastards?? Perhaps…or maybe it’s just an inanimate object that doesn’t know I still miss my mother dearly, but even my mother would admit that Amazon is awesome when they’re not reminding one of a difficult time in one’s life. Luckily, my mom had a good sense of humor and would have found it funny so I will picture her looking over someone’s shoulder reading my blog and having a little chuckle. Miss you mom! PS Now Amazon will have another post of my inspirational mom to base it’s widget thing on! Share the post "Amazon is an a$$hole"